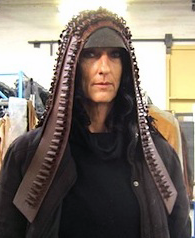 Bullet belt headdress made from custom-made leather bullet loop bands. From inside out, he appears to be wearing a long sleeve rib-knit sweatshirt, with a mesh tank top over that. 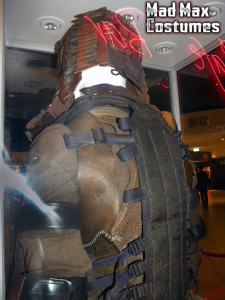 Then there is some kind of brown leather harness. 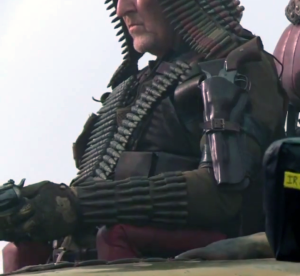 On top of that is a South African M83 vest that has had all of its pouches stripped off, and to which is attached leather pouches and leather patches to hold ammo. 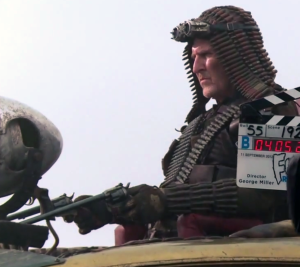 There are keepers that hold up his belt, which may be attached to the M83 vest. 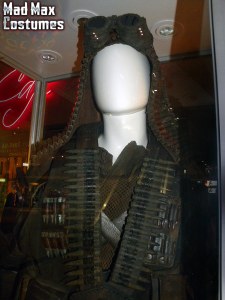 Over all of this is a V-shaped leather mantle full of bullet loops. 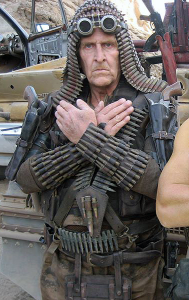 On his arms are bullet loop gauntlets/bracers and leather revolver holsters holding a pair of Colt New Frontiers. 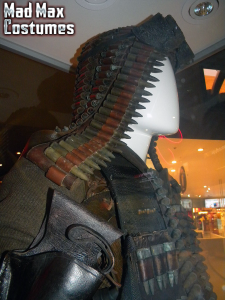 The holsters look identical to these, apart from the buckles used. 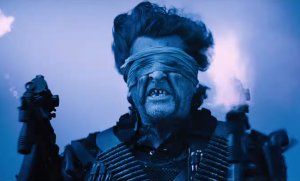 The holsters appear to be attached with bands of bicycle inner tube. He is wearing Fox brand gloves, possibly a black Dirtpaw style. 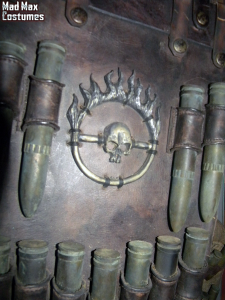 Hanging from the belt is a groin protector decorated with more bullets, and a flaming steering wheel emblem. 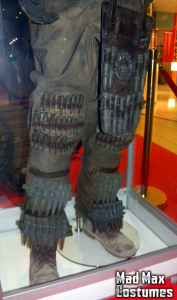 Baggy trousers are decorated with rows of bullets over the shins and onto what appears to be integrated knee padding. Sturdy leather lace-up boots.